In an effort to promote my book, I started blogging, but the blogging thing took on a life of its own. I think I should probably do a little bit of promoting so I am offering an excerpt from my book. I selected this chapter because it is when Jose (my favorite character) tells his story to Vicky. They are both ghosts. Although this book revolves around death, it is an uplifting, inspirational ghost story – it is the ghost’s story. One of my readers from Australia called it an “Ethical Fantasy”. 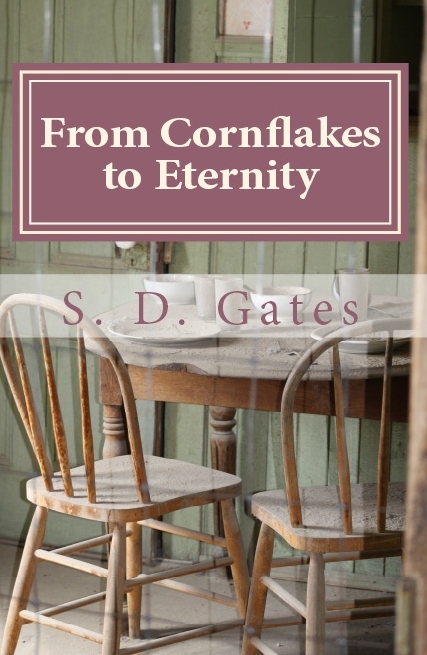 Below is an excerpt – From Cornflakes to Eternity. I hope you enjoy it. When Jose was a new ghost, he had just returned from the long tunnel, after talking with the Lady in Red, whom he had absolutely loved. He had loved the Nice Place, at the end of the long tunnel, but he had asked the Lady in Red if he could come back, because he needed to see the nurse who had taken care of him in the hospital and let her know it was okay he had died. He had died so suddenly, nobody was expecting it. He had been doing really well and they all thought he would be going home to his family soon, because he was doing so much better. But that never happened. He never did go back to see his family, but he wasn’t mad and he wanted the nurse to know that. He had just wanted to come back and say to the nurse, I’m not mad, and then go back to the long tunnel with the Lady in Red. That’s all he wanted to do. Really quick. But it hadn’t worked out that way at all, and now he was stuck, being chased by an Evil Guy, hiding during the daylight and being generally miserable and alone. Of course, it had all gotten so much better when Vicky had come, when he went to find her in the operating room. The nurses had been talking about this little girl, the one who got run over by her Mom in the driveway, and how she was in the operating room, with doctor people trying to save her. Jose had been really brave going up there, to the operating room, cause it meant going up to the floor where the Evil Guy was, but he had done that, because he wanted to see if the little girl, or Vicky, needed his help. He had been so glad that he had done that, and found Vicky, because it meant being stuck in the hospital wasn’t such a bad thing, now that he had a good friend to hang out with. So it was a shock to everyone that night when he died. His nurse had taken it very badly, feeling completely responsible for his death, thinking maybe if she had seen the signs, the whole thing could have been averted. Jose had wanted to come back from the tunnel and let her know he was okay and they shouldn’t worry, because everything had worked out fine. “Well, what kind of battery was it then?” Vicky had said, still having trouble figuring out why this would kill him. “It was one of those tiny, little batteries, you know the kind they put in the toys, to make them light up and do all that other junk.” He had put his thumb and his index up to show her how little the battery was. Vicky still hadn’t been sure how a tiny little battery would kill him so quickly. He wasn’t real sure either, but it had. He tried to explain what he had heard the doctors tell his Mom, when they had all been standing around his bed, looking at him. Vicky and Jose had laughed about that. A hairy elephant inside Jose, how ridiculous was that? They sat there and laughed quite hysterically, a little boy of four years old, wearing a wife beaters shirt and a baseball cap, and the girl of ten, wearing pink boots, sitting in a darkened room, just off the nurse’s station, laughing. They laughed about that a lot. A hairy elephant inside Jose. And then they thought it would be even funnier if Big Bird was inside Jose too, visiting his friend, the hairy elephant, who Vicky pointed out was really a Wooly Mammoth. But hairy elephant sounded funnier They imagined Big Bird inside him and how every time Jose coughed, little yellow feathers would come flying out of his mouth, puffs of yellow feathers. That was even funnier. They kept saying that over and over, and each time they did, they would laugh more. When Jose and Vicky had laughed themselves into a ghostly exhaustion, they sat silently smiling at one another. “Where did you get the battery from? Was it just lying around on the floor and you decided to eat it? Jose shook his head vigorously and told her how his Dad had been saving his money for months to buy this toy Jose had so desperately wanted. It was a race car, with lights and sirens and all kinds of other cool stuff. He had seen it on television, when he was over at his cousin’s house. Jose’s family didn’t own a television, they didn’t have enough money, so he would go over to his cousin’s house to watch TV. It was one of his favorite things to do. Vicky was amazed and appalled at the thought of family being so poor they couldn’t afford one TV. She thought about her house, where they had a television in almost every room, hidden neatly in huge entertainment centers and built-in bookshelves. She had asked Jose why his family had been so poor. He had shrugged his shoulders and said he didn’t really know. His Dad was a migrant worker, he worked in the fields for long hours every day, picking fruits and vegetables for hours and hours. He got up early, before the sun was even up, and piled into a big white van, with a bunch of other men, to go to the fields. He’d come home in the evening as the sun was setting, covered in dust, sticky with juice from the fruits, too tired to even talk to his family, too exhausted to play with Jose and his siblings. After eating his dinner in silence, he would lay down and sleep so he could do it all over again the next day. Jose told Vicky his Dad did all the work the white men didn’t want to do. That’s what his Dad said, ‘I do the work the white man will not do, that’s the way I make my money, that’s the way I eat, that’s the way I feed my family. If the white man had to do all the work we do, nothing would ever get done. Nada. The fruits would rot on the trees, the grapes would wither off the vines, and the lawns and gardens would become overgrown with weeds. The white man should be happy we are here. They need us.’ That’s what his Dad always said. In the summer, his Dad and his Mom would pack the family into a van, with another family and they travelled to Oregon. The van would be so crowded, children sitting on adult’s laps and certainly not enough seat belts to safely secure everyone, and they would make the long drive north. Anyone that was old enough to walk and understand what needed to be done was enlisted, put out in the fields to pick whatever needed picking. And that is how Jose’s family made enough money to eat and live in the small, rundown, two bedroom house in the Central Valley of California. And his parents did this willingly, because they had come to America to give their children better lives, more opportunities and all of this was a small price to pay to make that happen. He and his parents, and six other siblings shared the small house. When family members, newly arrived from Mexico, needed a place to stay, Jose’s family and all the other families on the street, would make room for them. Jose really liked that, because there were always tons of kids to play with and they played outside in the sandy front yard and on the street until his Mom and whoever else’s Mom, who might be living with them at the time, would tell them to come in. All the kids would eat dinner, while their respective Moms stood and watched, making sure they had everything they needed, making sure they ate their food, because nothing could be wasted. A plate piled with food would be set aside for his Dad, ready for him when he came home from the fields. The children would clean up their dishes and go outside and play, leaving his Dad to eat undisturbed. That’s the way it was at his house. Jose had looked at her, with a confused look on his face. “Why? I loved having all my family around me. It was so much fun. There was always someone to play with and I was never, ever lonely. Did you have lots of people at your house, lots of family?” he asked Vicky. Jose had looked at Vicky with sad eyes. Vicky hadn’t thought she was sad, but maybe she was and she just hadn’t realized it when she was alive, when she was in the solid world. Maybe that’s why she felt the need to surround herself with things, to make her feel less lonely. Maybe if she had all those family members around her, and lots of people to talk to, she wouldn’t have needed all that other stuff. Maybe she wouldn’t have needed that sleepover and maybe she wouldn’t be dead, talking to Jose, another dead child, in a room off the nurse’s station. Maybe. Maybe. Maybe. Jose thought about it for a minute and slowly shook his head. Both children fell silent again, considering how different their solid world lives had been, and how it didn’t matter that much anymore because they were both dead and they were both trapped in the hospital trying to get to the long tunnel, and back to the Lady in Red. That is beyond awesome! How do I get a copy of your book? Yay!!!!! I am glad you liked it!!!!! It’s on Amazon – you can get it in either the old standard paper back or on ebook (can even load it to your phone). I hope you enjoy it and again thank-you so much for taking the time to read my post!!!! Yay!!!!! Thank-you so much for taking the time to read this (rather lengthy) post. The book is available on Amazon, either in standard paperback or e-format (can even load it on to your phone). I hope you enjoy it!!!!!! I really enjoyed your book, as you know. And I am hoping that my honest review will help you get some more readers. I am even planning on giving it as a gift to my mother, that’s how much I enjoyed it. Solveig, that is so cool that you would give it to your Mum!!!! Can I reblog your review? Would that be okay? I am not quite sure how to do that, but I would really like to if with your approval of course. Hope all is well with you!!!!! I think you just hit the reblog button on the post, write a comment that goes with it. Thank-you. That sounds pretty simple. I should be able to manage that!!!!! I have never done it either, but I guess that’s how it works. I will try it and let you know how it goes!!!! wow, that was a great preview. Do you know if there’s going to be a version of this work in audiobook format? There isn’t. But I suppose I could figure out how to do that. I see there is capability on the creatspace website – at least that’s where I think I saw it. I think it would be really entertaining as an audiobook. I will have to look into it. I am glad you enjoyed the excerpt!!!!! Jose is my favorite character, because he is so spunky and full of life – even though he is a ghost!!! I am a horrible marketer. Thanks for taking the time to find it!!!! Juts read the extract and it’s lovely. Got a copy. I don’t often buy books on a whim but I love the tone of this one. Oh thank-you so much. I do hope you enjoy it. It’s a little sad at first but much of the main characters are based on children I have worked with over the years. Yay!!! now I have a happy feeling because you are going to read my book!!!!!! I like children, mostly, and get on well with them. I hate to see them unhappy or neglected. This evening our supper was interrupted when a couple of under-fives ripped off our letter box. Son went to the bar round the corner and hauled out the father of one of them. He could barely stand upright. Instead of eating with my own family and having a civilised conversation I was out in the street berating a drunk for neglecting his child, then berating the bar owner for letting his customers get into such a state when they were supposedly looking after small children. I felt like asking him if he didn’t want the kid I’d have him. That is partly why I wrote this book, because through my years of working Pediatrics I have seen such blatant neglect and such subtle neglect by parents towards their children. And I had to make it okay for the kids in my head – their little faces have been bouncing around in my head for years and I just put them into these 3 characters and made it okay for them. I think you will appreciate it – especially after what happened tonight in your neighborhood. In my book, there are place for those kinds of parents. Looking forward to reading yours too!!! !